Desperate to solve a global food shortage, ExoGen scientist Dr. Ella Masse oversees the creation and release of RC-714, a gene that unlocks millions of years of adaptation and evolution, allowing crops to use long dormant junk DNA to rapidly adapt to any environment. The world’s food supply grows aggressively, occupying every inch of earth, no matter how inhospitable. World hunger is averted. Humanity flourishes. RC-714 is digested, absorbed and passed on. The Change affects small, fast breeding mammals first. They multiply with the same aggressive speed as the ExoGen plants, but a new, insatiable hunger drives them to violence. War between species breaks out. And then RC-714 reaches humanity, along with every other large creature on the planet. Civilization implodes, as every living thing that consumed the ExoGen crops begins to adapt to a world full of predators, accessing genes dating back to the beginning of life itself. Peter Crane and his son Jakob survive the Change, living in their family farmhouse and eating non-ExoGen food from a biodome, one of many provided by Ella Masse, who discovered the ramifications of her breakthrough too late. The pair ekes out a living in a world full of monsters, surviving until Ella shows up on their doorstep with her daughter, pursued by desperate predators and men alike. As the farmhouse falls under attack, Crane learns that the end of humanity, of life on Earth, can still be averted: if Ella Masse and her daughter survive, and if they make it to the other side of the country without being captured...or consumed. 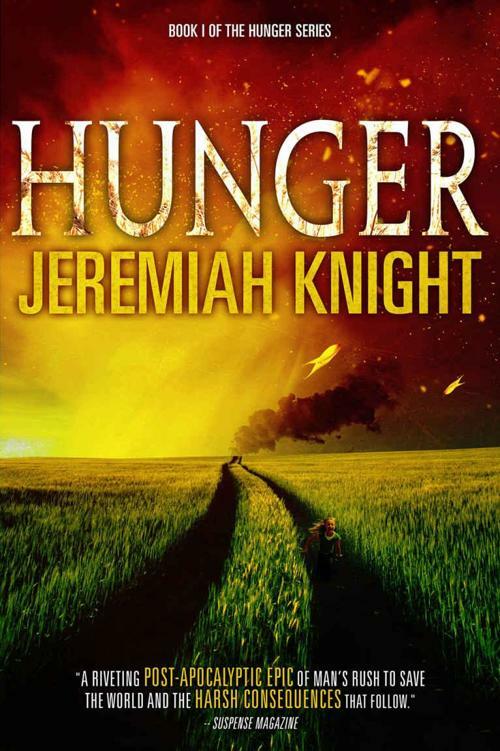 Jeremiah Knight merges the science of Michael Crichton with the horror of Stephen King in this fresh take on the post-apocalypse, creating a true worst-case scenario for GMO crops that will have people reading labels before eating their next pepper, tomato or kernel of corn. for making me think about what I eat. “What the hell am I looking at, Jeff?” A surge of annoyance threatened to overwhelm Dr. Ella Masse’s practiced serenity. She was the lead geneticist heading up ExoGen’s GMO division. She worked with hundreds of people, from hard laborers, to farmers, to marketing gurus and her fellow geneticists. Of all the people she encountered, it was her own ilk that burrowed under her skin and scratched at her nerves. The more brilliant the scientist, the more frustrating she found them. And Jeff Sexton topped the charts in both brilliance and irritating habits, the worst of which was his inability to give a straight answer. “You tell me,” he said, wiping soil from the knees of his white clean-suit. Like most of the gene-hackers working for ExoGen, Sexton didn’t just work in a sterile lab. He got in the dirt, observing growth patterns and rates, and water consumption and crop yield. They could have had cheap labor work the dirt, but Masse wanted her people to feel connected to the job. To care about it. When that happened, people worked harder, and in a field ruled by the mind, that meant her staff was working even when not at work. They woke up with new ideas. Beat her to the office. Finished ahead of schedule. “Use your eyes, Ell.” She shot him a look over the top of her narrow glasses. “Dr. Masse,” Sexton corrected as he bounced on his feet, a belled hat away from acting like a court jester. She’d never seen the man so worked up before. Maybe this will be worthwhile, if I can figure out what put the ants in his pants. She stepped into the hundred-foot-long greenhouse. The blue sky above was bold and blue, the sun blazing down on them. The curved glass ceiling would have been all but invisible if not for the white support structure. The room looked more like it belonged on a space station, except for the corn. Rows of it. She stepped up to the nearest ear, gripped the husk and peeled it down, revealing a grid of bright yellow, bulbous corn kernels. “Then maybe you should use your nose,” he said. The man just jounced around, waiting for her to stumble upon his discovery. She smelled the corn through the filter in her suit. Nothing special. She snapped off the ear and tossed it deeper into the greenhouse, then wheeled around on Sexton. Her lungs filled with pressure, preparing to vent, but then she noticed a different smell. She paused, turned back to the corn and sniffed. She could smell the corn. Lots of it. The odor had become so familiar to her that she rarely ever ate the stuff. Nose lifted, she stepped deeper inside the greenhouse and quickly became aware of a second sensation. Her skin prickled from dry heat. Her eyes began to sting. Before realizing what she was doing, Masse crouched down into the shade of the corn stalks. But even in that twilight shadow, she could see there was something wrong with the soil. It wasn’t soil at all. With wide eyes, she turned to the corn again. The parts of the plants she could see were just a small tip of the whole, with the rest being underground, stretching down to the water table, which in this part of New Mexico, was deep. They entered the decontamination unit, which was essentially a man-made whirlwind pulling any dust, seeds, pollen or other potential contaminants off their clean-suits, and sucking it away. This prevented one crop from contaminating another, making sure their observations were accurate and reliable. There were a hundred greenhouses in all, dedicated to the world’s ten most common and important crops—corn, rice, wheat, soybeans, potatoes, cassava, sweet potatoes, sorghum, yams and alfalfa. Each of the ten greenhouses in a grouping were arranged around a central hub, spokes without a wheel. From the hub, each single crop’s greenhouse could be reached. But to visit a different crop without returning to the hub, you had to head outside, into the heat. Most of the ExoGen staff had no reason to visit multiple crops. The gene-hackers all had their own specialty crops. Masse was one of the unlucky few who found herself wandering the arid plain, working up a sweat, once a week for inspections and progress reports. Sexton was her first visit today, and if he’d managed to develop a strain of corn capable of growing in the desert...well, she’d cancel the rest of her day and order some champagne. This was the kind of world-changing stuff ExoGen wanted, and it would put them on the map, side by side with Sancio. They moved through the hub, a fifty foot wide circular space that was Sexton’s lab. His eager-eyed team of three men and two women looked up in silence, watching them pass through, in on the joke’s punch line. Sexton would never joke about this. First, because he cares, and second, because he has no sense of humor. She barely heard the fans whipping the air around her inside of greenhouse C-7’s decontamination chamber. Her eyes were on the glass door, beyond which was the access door to the greenhouse. When Sexton opened the door, she hurried past, punched in the four digit code that gave her access to every room in the facility and pulled open the door. Visually, the crop was identical to what she had seen in C-8, but it smelled of rich soil, manure and moisture. These were the elements that had been missing from C-8, and yet the result was the same. She nodded. That was standard protocol when trying to develop crops that thrived in multiple environs. She knew Sexton would have seen the eventual outcome. Once the corn spread through the remaining five greenhouses, if it was as aggressive as he thought, it would eventually work its way outside. “That’s not much time,” she said.